The exceedingly tired fellowship had fought for hours to find a way, anyway, out of the Old Forest. Though this had not been Caethir’s first journey through the wood, he was still caught out by the malevolent tree roots that reached out to trip him up. They had often succeeded too, at which Herynglas had sneered on more than one occasion. Faeladar and Reggie had done a heroic job at distracting wolves and bears while Caethir had felled them from a distance, with only minor injuries. From time to time, Herynglas’ Eagle had flown above the Forest to check their progress and report back, to keep them roughly on track. “How good is wolf meat to eat?” Faeladar wondered out-loud, acutely aware that he and his companion had not eaten for some time. “Not as nice as bears, I’m afraid. However they are much easier to carry to a campfire!” Caethir laughed. “Good point, my friend” the Dùnedan replied, hauling one wolf onto his shoulder, “I hope we can pause and catch our breath soon”. So it was an hour or two later that they stumbled across a very weary-looking group at the Forest’s edge, who were already making camp. Caethir halted suddenly in his tracks, put his head in his hand and rubbed his temples. “Are you saying we led us wrong?” Herynglas retorted. Caethir rolled his eyes and shook his head. 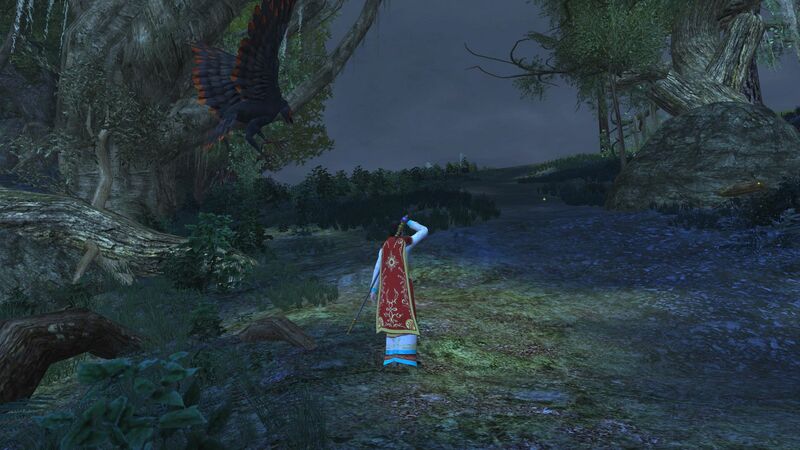 “Oh no, your Eagle has definitely led us out of the Old Forest.”, he started slowly. “What’s the matter, friend?” Reggie asked. “Afraid of a few dead things, Caethir?” Herynglas taunted. “Look, now is not the time for that attitude. We can talk another time.” he snapped back. Herynglas shrugged, turned on her heels and made her way a little up the path. 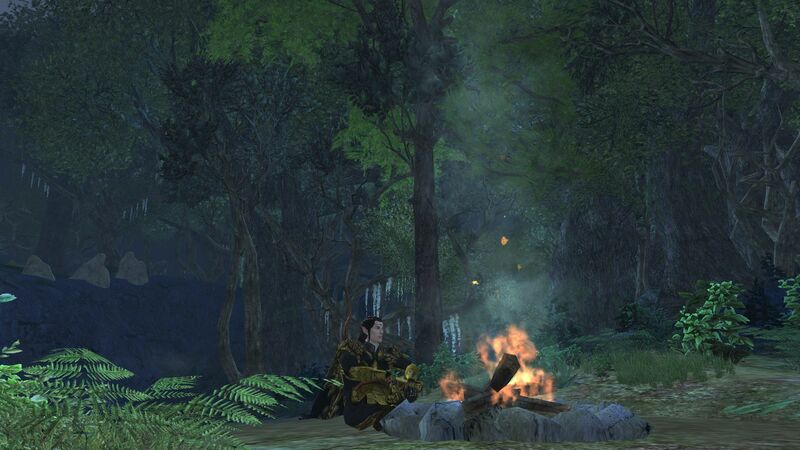 Caethir sighed and began making his own campfire, trying to distract himself from the prospect of encountering things he most feared. Faeladar flung the wolf carcass down and slumped down next to him, motioning to Reggie to do the same. “I don’t understand. 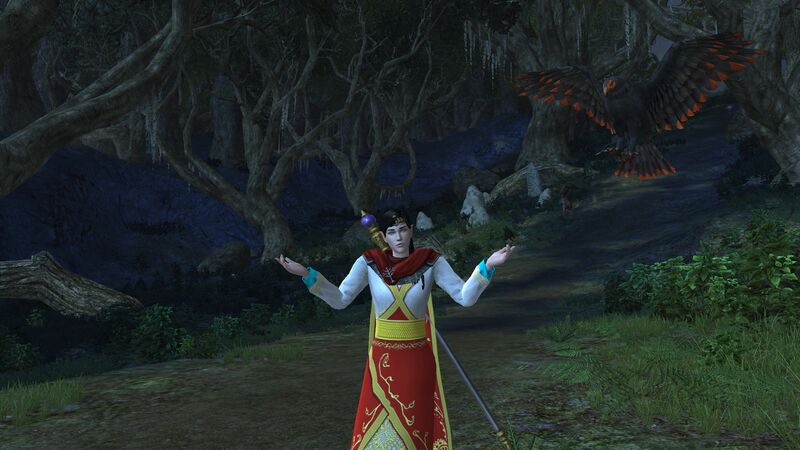 You’re clearly an Elf with wood-craft, yet you followed us rather than led us through the forest. Why?”, Faeladar asked gently. Caethir blew onto the kindling and a flame gradually took form, the fire licking hungrily over the dry wood. Adding some extra leaves and larger twigs and branches he found nearby, he positioned himself between the fire and a cold breeze that was wafting through the silent trees. Once content the fire was burning as it should, he sat down beside it. “It’s a long story but I can’t, and probably shouldn’t, try to lead with…our current group make-up,” he said, casting a glance towards Herynglas who was peering through the trees to gauge the way forward. “What’s her problem with you anyway? Feel free to tell me to shut up if you want. I’m just concerned.”, the Dùnedan assured him. Faleadar chuckled softly and he and Reggie began skinning the wolf ready for a late supper. “Can you make use of this thing’s skin, Elf?” Reggie asked. 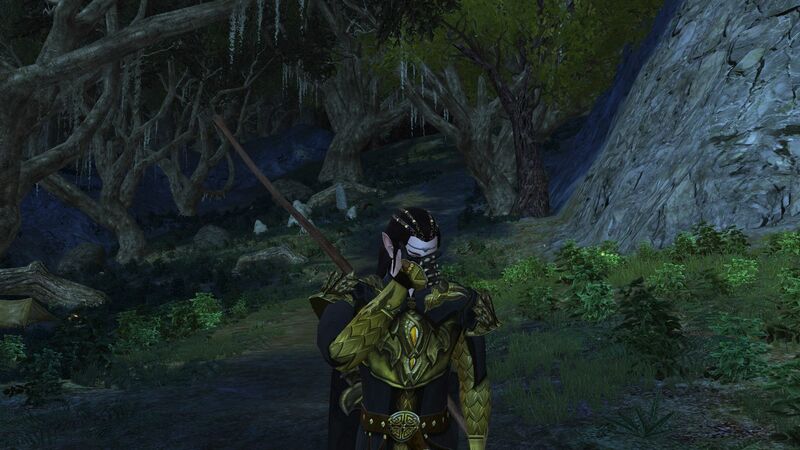 “The Barrow-Downs weren’t exactly on my top places to visit in Bree-land. But it’s either that or go back into the Forest and our supplies are pretty low now. I think reaching Bree as fast as possible will be better for everyone concerned,” he replied, waving a lazy hand towards the Lore-Master. Herynglas herself, satisfied she knew how to proceed, strutted back to the campfire. Her Eagle followed a few moments later with some smaller creatures in her talons, landed a stone’s throw away from the fellowship and began tearing at her own dinner. 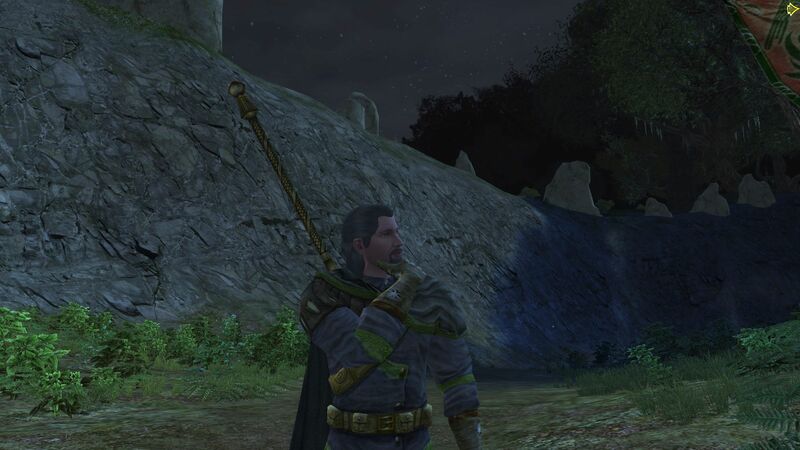 Herynglas kicked some dirt and stones away near the fire and slumped down on the opposite side of the fire to Caethir. “Having looked out over the Barrows, we think Dead Man’s Perch should be our next stop,” she stated curtly. Faleadar cast a glance at Caethir and smirked. “That makes sense yes,” he managed to reply without laughing, “let’s run with that”. Herynglas rued her decision to sit where she had, as she couldn’t see what had transpired between Caethir and the Man. She frowned and said nothing. The unlikely fellowship endured an awkward meal as the sun began to set, before each pitched their tents. If the next day was to bring them through the haunted Barrows, they needed as much rest as possible. As each retired for the night, Caethir stoked the fire and moved the drying wolf-skins closer to the comforting warmth. It was some hours until he too, decided to rest. He only hoped he could arrive at Bree before the Hobbits so they didn’t worry about him. One day at a time, Elf. One day at a time.